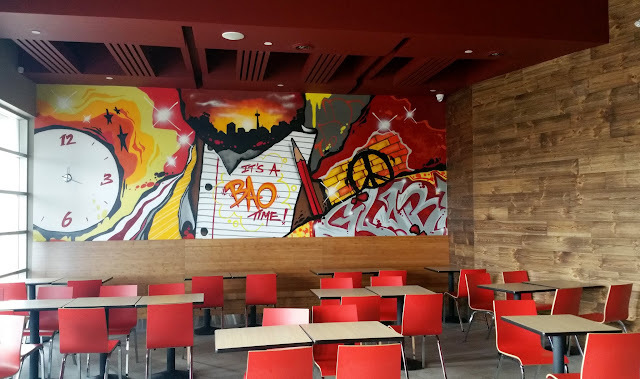 It's a Bao Time opened its doors a week ago on Friday, November 6, at 230 Commerce Valley Drive in Markham. Serving steamed baos, banh mi sandwiches, tacos and fries, it's certainly a bao time that uptown gets their very own modern Asian street food joint (sorry I couldn't help it...too easy!) Being the keener that I am, my friend and I went to check out the place last Saturday for lunch. The 40-seat restaurant was quite empty when we dropped by; I wasn't surprised though since it was only their second day. Not only that It's a Bao Time mostly cater to the weekday lunch crowd - there are a lot of corporate offices nearby so it's an ideal spot for a quick grab-and-go lunch (in case you still have no clue as to its whereabouts It's a Bao Time basically took over part of the former Go For Tea space). Having said that, more and more people trickled in as we started eating. From there you can choose Pork Belly, Japanese Fried Chicken, Korean Beef Bulgolgi, Veggie, Grilled Chicken, Beef Brisket, Battered Fish or Duck Confit. 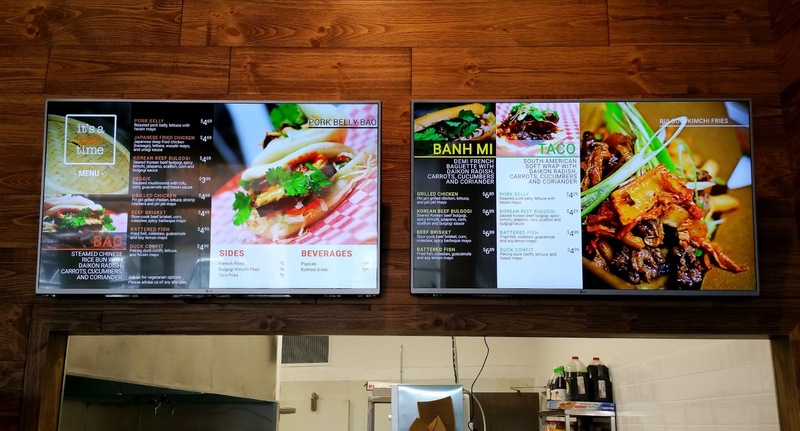 All these options are available for the Baos but only selected ones are available for the Banh Mi and Tacos. It's a Bao Time offer three sides - french fries, kimchi bulgolgi fries, taro fries - and a selection of pop and bottled drinks. Feel free to click here to view the whole menu. I always choose Boylan Sodas over regular pop ($2.50 ea). We obviously didn't end up ordering everything because of the countless possible combinations but we did get through all the options aside from Veggie and Duck Confit. Nothing against them it was simply because Veggie is well, Veggie, and we overlooked the Duck Confit for some reason. Anyway, several people have asked me already how It's a Bao Time compare to Banh Mi Boys. My answer to them has been "Sorry, but I have no idea". This is because I really don't. I've only been to Banh Mi Boys at most, maybe three times, and all those visits happened three years ago when they first opened in 2012. I'm really the worst person to ask when it comes to this very specific question/comparison. What I can do though is compare It's a Bao Time's Pork Belly Bao to Lucky Red's pork belly bao that I had recently. Yeah, I know it's only one item out of the bunch I tried at It's a Bao Time but I figured it's still better than nothing. So, let's start with that. All things considered I enjoyed the pork belly bao at Lucky Red more. Although the generous piece of pork belly at It's a Bao Time is tender and juicy it lacked a lot of flavour. It could stem from a number of different things: seasoning, marinating, cooking method, time, etc., but whatever it is all I know is that the pork belly needs a lot more punch. The steamed bao at It's a Bao Time is nicely done. It's soft and fluffy but yet I still prefer the one at Lucky Red. Finally, the pork belly bao at Lucky Red was topped with heaps of scallions and pickled onions which was great for texture as well as cutting the fattiness of the pork belly. On the other hand, the shredded lettuce at It's a Bao Time pales in comparison. Since I'm a sucker for flavour and texture, I would say my favourite bao out of the four that I had was the Japanese Fried Chicken Bao. The karaage was hot and crispy, and the combination of the creamy wasabi mayo and the savoury unagi sauce really worked. The two other baos were good, not great - the Grilled Chicken was nice and moist but sadly the shrimp cracker went unnoticed. The Beef Brisket was also tasty but I felt the overdressed coleslaw was competing with the brisket. My favourite thing that day was the Korean Beef Bulgolgi Banh Mi. It's a Bao Time's modern take on the Vietnamese sandwich and this particular banh mi was excellent. The baguette, which was airy and delicate, had a very crispy exterior and the seared beef bulgogi topped with kimchi, zesty jalapeno, corn, scallion and bulgogi sauce makes you want to keep eating and eating. I liked the Battered Fish Taco too. It had a light batter and the fish was hot and flaky. However, similar to the Beef Brisket Bao the coleslaw and the guacamole in the taco left no room for the fish to shine on its own. I also prefer their steamed bao and banh mi over their tortilla. Lastly, the sides. The Taro Fries came highly recommended by the owner and even though my friend loved it I can't say the same for myself. Some of my fries were overcooked and I found them a bit too dense. The Taro Fries also got cold really fast for some reason and because they were cut thin they became really dry when cold. I wish It's a Bao Time offered taro chips instead of taro fries. Okay, I know I said my favourite thing that day was the Korean Beef Bulgolgi Banh Mi but I enjoyed their Kimchi Bulgolgi Fries just as much. I liked everything about it - the kimchi, the beef, the fries, the scallions. I guess the common theme here is me loving all things with bulgogi and scallions! There were definitely hits and misses from my experience at It's a Bao Time but like all new restaurants, this is perfectly normal and understandable. Every new place needs time to settle in and iron out the kinks. I've also thought about how different combinations of topping + vessel will result in different experiences (for example, I may have enjoyed the beef brisket in a banh mi more, or the battered fish in a steamed bao). The owner told me that they are looking into offering weekly and monthly specials as they further research and develop the menu, which is exciting. So with that in mind I'm sure I'll check back in a month or so to see what's new at It's a Bao Time.